Hard-boiled eggs aren’t always so easy to make perfectly. And then peeling them can be a disaster when some of the shell sticks to the egg white leaving a macerated mess of an egg as the end result. I think I have discovered the solution to making the perfect egg and getting the shell off with no damage to the egg white. Read on! Start off by putting the eggs in a 4-quart saucepan so that they form only one layer. Fill the pot with cold water to one inch above the top of the eggs. Bring water to a boil, uncovered. Immediately remove the pot from the hot cooking surface; cover the pot; and place it on a surface to rest. Remove the eggs and place them in a bowl of ice water immediately after the timer goes off. 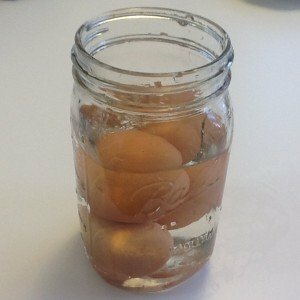 Place no more than 3 eggs in a quart-size wide-mouth jar (I use the Ball Mason Jar). Add water to cover just to the top of the eggs. Place your left palm over the opening of the jar and your right palm on the bottom of the jar. You are holding tight so the water will not spill out. Begin to shake the jar with the eggs and water vigorously up-and-down and side-to-side for about 15-30 seconds. Lo and behold, the shells will come off the eggs. 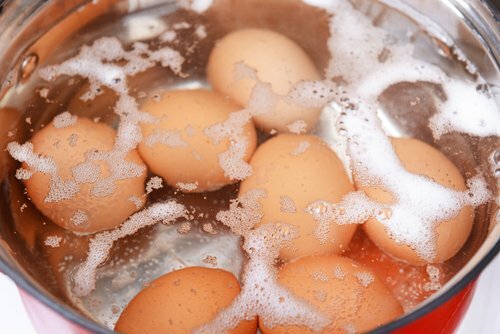 Rinse the eggs with running water to remove any shells that are remaining.